What happens when you gather 3,000 social media marketers for three days of sessions and networking? You get a front-row seat to the latest tools, tips, and trends for social media marketing. I recently attended Social Media Examiner’s Social Media Marketing World conference in San Diego, and the topic that dominated the conference this year was video. Kim Garst, CEO and Co-Founder of Boom! Social, said that live video provides an opportunity to connect with your viewers, customers, and prospects in a real way. Once you’ve established how to use livestreaming in your marketing, the next step is to drive them to your email list. The real relationship and business growth come from your email list. You can drive viewers to your list by offering them something free like talking points from your live video, checklists, worksheets, or a discount for signing up. Share your signup link in the description and comments of your livestream and call attention to it during your broadcast. Create an autoresponder email that sends new subscribers the free content when they opt in. Tip: Is your business new to email marketing? Try email marketing free for 60-days! Facebook marketing expert Mari Smith said that we can’t do business as usual on Facebook. You need to create content that Facebook and your followers prefer. Right now that content is recorded and live video. Animoto – includes commercially licensed music, storyboards, voice-over features, text overlays, collages and layouts, and a square video for social networks like Instagram. Adobe Spark – offers visual themes, text overlays, free music, and a mobile app to create videos on the go. Animatron Wave – choose from 2.5 million royalty-free video clips, photos, and audio clips; add your logo or text overlays; and resize your video for Facebook, YouTube, Twitter, and Instagram. Flipagram – create video and photo slideshows and add free popular music. Flixel – add motion to photographs and create timelapse videos. PicPlayPost – combine photos and video into a collage that you can share on social media. Ripl – create video by using a design catalog of more than 150 designs, adding your logo, adding royalty free music, and choosing from hundreds of fonts for text overlays. To be successful with Facebook Live, you need to build an audience. Social media strategist Amy Porterfield shared a plan for increasing your viewership. Jennifer Watson, Social Media Strategist for The Weather Channel, said sometimes simple videos can be effective if they share something your audience is interested in. 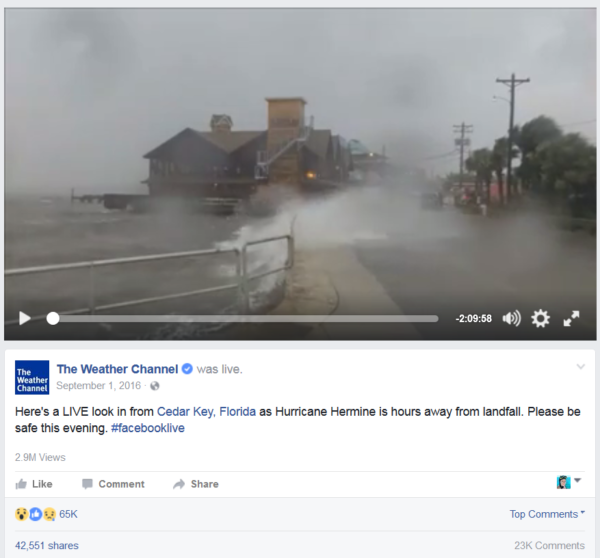 The Weather Channel broadcast a livestream of Cedar Key, Florida, as Hurricane Hermine approached. They had planned to broadcast for 15 minutes but extended it to two hours as 2.9 million people tuned in to watch. A livestream of Manhattanhenge in New York City — which occurs in July when the sun is aligned with the east-west streets of Manhattan, generated half a million video views. Jennifer said that you can generate more live viewers by using Facebook Live’s prescheduling feature — users who RSVP will get a reminder. 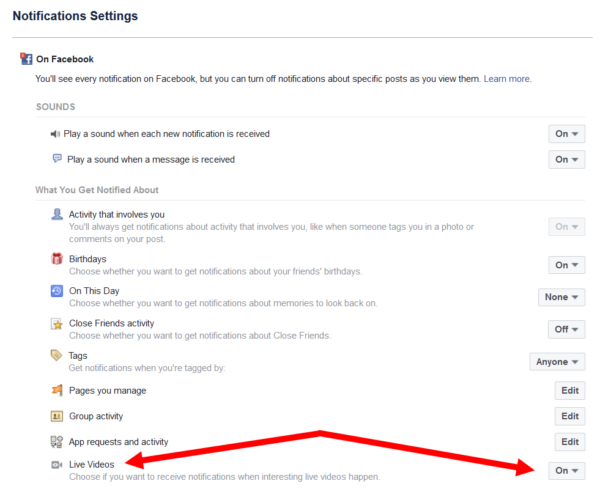 Or create a screenshot that shows users how to opt-in through Facebook to receive live video notifications by going to Settings> Notifications> On Facebook > Edit > Live Videos. Level 2 is using your phone plus gear like a microphone. Level 3 is livestreaming from a computer and using software like Wirecast that allows an overlay with your logo on the screen and titles as well as side by side interviews. Level 4 is a TV-quality livestream that uses a studio, Wirecast, graphics that include your branding on the lower third of the screen, professional lighting, and professional audio. If you want to try livestreaming, use these guidelines to work your way up. When you put in the time and effort and use the right equipment and tools, you can create a professional Facebook Live broadcast. Use these tips to try video for your business! If you haven’t been using Facebook Live or recorded video, now is a good time to add it to your marketing plan. People spend 3 times more time viewing a Facebook Live video than content that’s no longer live. And video, in general, has 4 times the engagement of static content. These tools and tips should give you a good place to start. Looking for a place to start? Use these 10 Lessons We Learned From Our First Facebook Live.